Featuring an innovative design that's stylish, portable, and incredibly compact, this sleekly attractive Bgears b-Envi Cube Case is a definite must-have. Designed for ATX motherboards, the "No Window" version of the b-Envi Cube Case features a built-in 58-in-1 card reader that allows you to read and write to just about every memory card media out there. 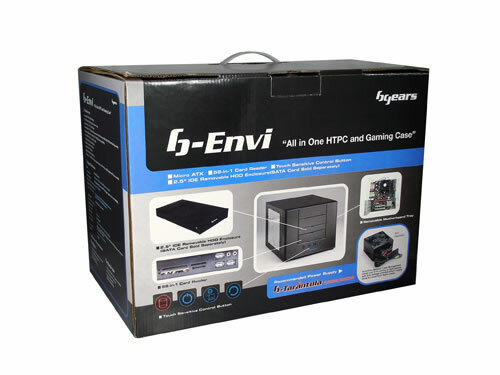 Loaded with convenient features, this Cube Case incorporates a design that allows for easy accessibility, offering a removable motherboard tray, touch sensitive power/reset/lock buttons, and front I/O ports with a flip down door to prevent excessive dust build-up (and that's only the beginning of it's many features). Material: Aluminum 1.0 Dimensions: 9" x 11.2" x 14.7"
2.5” Removable Aluminum IDE HDD Enclosure. 3 x USB 2.0 Ports. Audio/Mic. Include 1 x 120mm fan (Blue LED Fan or Black Fan). Solid "No Window" Top Cover. *Note - Box is dented. Item is brand new and in perfect condition.